Thomas Honeyman, musician, designer and COO of Findmysong.com makes a succinct argument on how the world-shattering events in the music industry is a millennial phenomena. The old music industry is dead. We’re standing in the ruins of a business built on private jets, Cristal, $18 CDs and million-dollar recording budgets.We’re in the midst of the greatest music industry disruption of the past 100 years. A fundamental shift has occurred — a shift that Millennials are driving.For the first time, record sales aren’t enough to make an artist’s career, and they certainly aren’t enough to ensure success. The old music industry clung desperately to sales to survive, but that model is long gone. Technology is cheap and high-quality learning resources are free. As the result, artists have massively successful records without having set foot in a recording studio. This is how Millennials are playing both sides of the field: They’re creating more music than ever and releasing it onto platforms where their peers go to discover music. Powerhouse songwriting and production teams back dominant artists like Rihanna, Taylor Swift and Katy Perry. These production teams are one of the main drivers that keep the superstar artists on top. 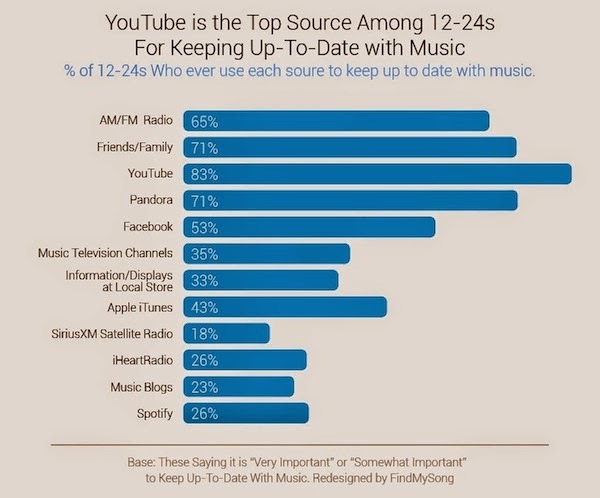 Working in teams allows these writers to churn out tons of highly listenable pop tracks.Now, Millennials are breaking down this final barrier, too.Services like FindMySong are connecting independent musicians so they can form their own dominant songwriting and production teams. The FindMySong model takes advantage of the fact that there are more independent musicians than ever before who want a piece of the major artist success without the major label strings. Although, Honeyman has a self-serving motive for pushing his point-of-view (and his company), his observations are worth considering. However, one factor he fails to mention is that the music industry created the conditions for their dependence on millennial whims by becoming youth-centric. The music industry's eagerness to cater to the musical tastes and whims of the young, no matter how wack or crappy the music, led to people becoming conditioned to the idea that most music is cheap and not worth paying for. So why not just get it for free?